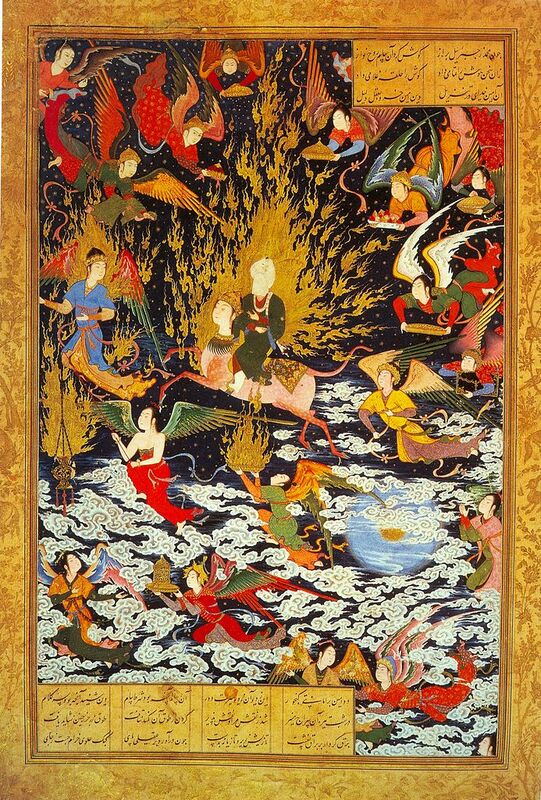 Above is one of the most widely known depictions of Muhammad’s Night Journey. It is a product of a less restricted phase of Iranian artistic culture in the 1500’s AD. I had seen this picture before I started my Quran project, and it comes to my mind foremost when I hear al-israa w-al-mi’raaj, particularly that odd human-headed animal (al-buraq). Yet all of it, all of it, comes from tradition. Last week, I said that one ayah of the surah explicitly mentioned The Night Journey and that two others very likely were references to the event. I looked around online to find when we will get more, but could only locate one future surah, the 53rd, with one more chunk of mysterious ayat that probably reference events from the journey. And that seems to be it for the Quran. So if the lessons from the event didn’t make it into the Quran, what are Muslims supposed to get from al-israa w-al-mi’raaj? How important is it to them? What purpose does it even serve in the religion? Well, the ayah I referenced in closing last week will give us one answer, and I’ll get to that by the end of today’s post. But first, we must take note of the majority content of this surah, which is full of details and subtexts that set up the relationships of Islam.